Abstract: These green single-sided DIMMs are wrapped in black aluminum heatspreaders, and fall into the PC4200 class. They are rated to run at 266 MHz with 4-4-4-12 memory timings, at 1.8V. Overclockers and enthusiasts as a group are gaining more influence in the computer world. After all, the majority of computer products these days come to the market integrated with overclocking/tweaking options. No need to modify components or hack a BIOS anymore! It makes a lot of sense for manufacturers to produce overclocker-friendly products like DDR-2 right away, since computer enthusiasts are the ones who are most likely to adopt the new technologies first, and recommend it to their non-techie friends and family later. 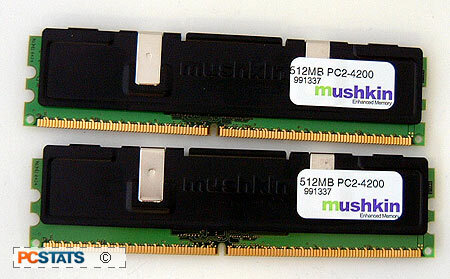 In this review, PCStats will be testing a set of new 512MB Mushkin PC2-4200 DDR-2 RAM modules, for a total of 1GB. These green single-sided DIMMs are wrapped in black aluminum heatspreaders, and fall into the PC4200 class. They are rated to run at 266 MHz with 4-4-4-12 memory timings, at 1.8V. The memory runs a bit conservatively considering it's Mushkin, but then again it seems like most memory manufacturers are being cautious right now. I would have thought that this was a pretty obvious 'no-no,' but I've heard a few stories about people who have tried to install a DDR-2 RAM module in first generation DDR RAM slots - as they were not aware of the differences. Though physically the same size, DDR2 DIMMs have more pins (240 vs 184 for DDR) and run on a lower voltage. If you were somehow able to force a DDR-2 module into a DDR slot you can pretty much kiss both the memory, and motherboard goodbye, so don't do it. Now getting back to the review, as we mentioned Mushkin is a bit conservative with their PC2-4200 DIMMs. They're rated to run at 266 MHz with 4-4-4-12 memory timings, but it seems like memory timings are playing less of a role in overall system performance with Pentium 4 processors, so don't be upset if your DIMM's can only run with loose timings. PCstats tests DDR-2 memory on an Intel Pentium 4 platform, since DDR2 has not yet been introduced into the AMD world. While we do test to see how high memory can go with aggressive 3-3-3-9 memory timings and the 3/4 memory divider enabled, we also loosen things up to see how fast the memory can go at higher timings. The reason is, Pentium 4 systems are not as reliant on latency timings as AMD systems, and having a higher clock speed can counteract the negative effect of higher timings. Mushkin and overclocking go together like Canada and hockey. Yes, they're that close. Of course, with DDR-2 still in its infancy, I wasn't about to push the memory very hard. Starting at 200 MHz FSB, the first thing I tried was running the memory at 3-3-3-10 memory timings. I was pleased to see that the memory didn't have a single problem with this, although we couldn't overclock very high at these timings of course. Still, it's nice to know that if you're at stock speed you can get this memory to run aggressively. Changing the memory timings back to 4-4-4-12, we started onward with the overclocking tests. Mushkins PC2-4200 easily passed the old 216 MHz mark the Socket 775 motherboard used to limit us to, and climbed to 223 MHz. At that speed a voltage increase to 2V was necessary. Continuing to 228 MHz, we again ran into memory related issues, and again a slightly higher voltage was the fix. Mushkin's PC2-4200 DDR-2 memory finally topped out at 231 MHz. Which means at 231 MHz FSB with the 2.66x multiplier enabled, the memory was operating at a 614 MHz frequency.